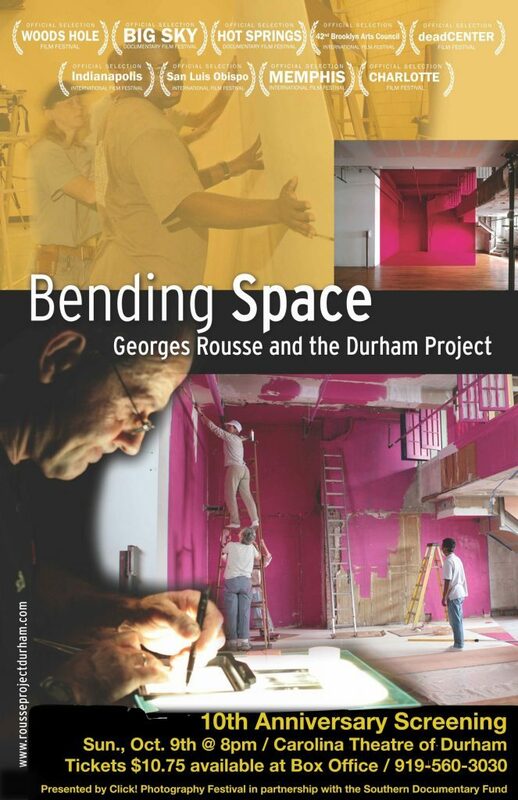 Penelope and Kenny are very happy to celebrate Georges Rousse’s 2006 transformative public art project in Durham with a 10th Anniversary screening of Bending Space: Georges Rousse and the Durham Project on Sunday, October 9th @ 8pm at the Carolina Theatre of Durham. Bending Space holds a special place in our filmmaking hearts. We like to say it’s aged like a fine wine. The film is a great snapshot of Downtown Durham just before the boom, a time when restaurants and bars were scarce and parking spaces plentiful. The film also captures an inspirational story about the power of public art and celebrates the creative process of visionary French photographer/installation artist Rousse. A decade after we produced Bending Space, much has changed in Durham. The film is a catalyst for dialogue about the relationships and tensions between the arts and development in a rapidly changing urban landscape. Patrick shares about his piece, “Wonder” installed at the Renwick Gallery in Washington, DC. We are excited to announce the broadcast premiere of Bending Sticks: The Sculpture of Patrick Dougherty on public TV in 2016. Thanks to the Southern Documentary Fund, UNC-TV, and SCETV for birthing the REEL SOUTH Series. More about the series. . . The American South – its history, people, culture, and landscape are infused with a sense of heritage like no place else in the country – or the world. Introducing REEL SOUTH, a new anthology series that highlights the masterful, provocative Southern tradition of storytelling, exploring the alluring and complicated region and its diverse voices and points of view. A collaboration between UNC-TV, and SCETV , and the Southern Documentary Fund (SDF), REEL SOUTH includes half-hour and hour-long independent, documentary films about the American South. The six acclaimed films of the pilot season (2×60, 4×30) have recently premiered at film festivals and theaters, building buzz and audiences. REEL SOUTH now brings these films to a national audience hungry for authentic stories from one of the most unique corners of America. 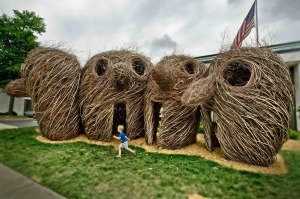 “CBS Sunday Morning” airs a segment on Patrick Dougherty with mention of “Bending Sticks” on Sunday, March 15th. Program info can be found here. Patrick is nearing completion of his latest sculpture at the NC Botanical Garden in Chapel Hill, NC. Penelope and I stopped by to visit with Patrick and see this work in progress. It was great catching up, hearing about Pat’s upcoming projects, and walking through the maze-like creation. This piece is part of the “Sculpture in the Garden” Exhibit and will be completed by Oct. 25th. There will be a “Meet the Artist” Fri., Oct 17th @ 7pm. “Bending Sticks; an evening with Patrich Dougherty” on Friday July 18th . 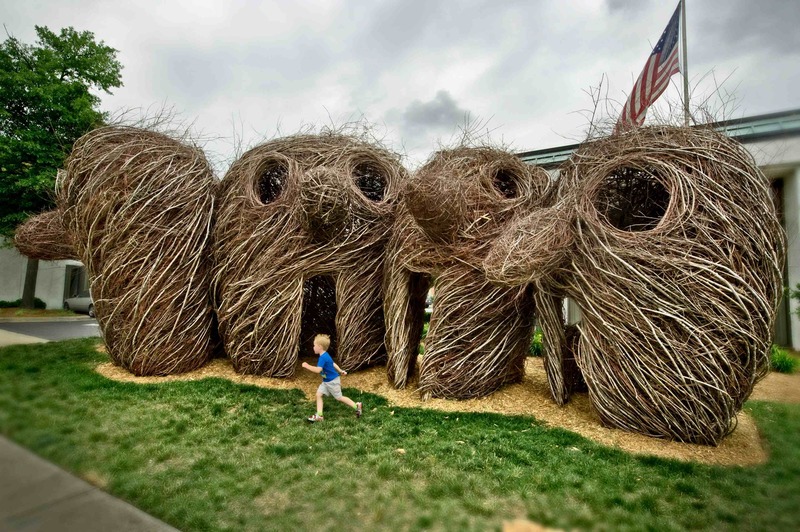 This event will include the screening of the film “Bending Sticks” which highlights the work of environmental artist Patrick Dougherty’s extraordinary and monumental scale works built with live saplings.The film will be shown at the Varsity Theater at 7:00pm followed by a reception at FRANK Gallery at which the artist will be present. Tickets are $30 and space is limited.